Lakshmipathy Adimoolam says, "We believe in Hindu spirituality." “Dinamalar” in Tamil means morning flower, and like a morning flower the daily shined on the media landscape of the country under the watchful eyes of noted freedom fighter, philanthropist and anti-caste crusader Thazhuvia Ramasubbaiyer, popularly known as TVR. Founded by TVR on September 6, 1951, Dinamalar grew from a single city edition to a multi-city edition published simultaneously from Tirunelveli, Tiruchi, Chennai, Madurai and Erode during his lifetime. Selling about a million copies daily, today the newspaper is published from 10 cities of Tamil Nadu including Chennai, Coimbatore, Erode, Madurai, Nagercoil, Pondicherry, Salem, Tiruchirappalli, Tirunelveli and Vellore, apart from Bangalore in Karnataka and Tirupati in Andhra Pradesh. But the values with which TVR nurtured Dinamalar have been long foresaken by the third generation of his family as our interview with his grandson Lakshmipathy Adimoolam establishes. What is left in the story, you must be wonder, as did Sharma. But, to his surprise, this seeking of editorial approval first was simply a ruse as when the journalist met his boss Lakshmipathy Adimoolam, the Director of the Tamil daily far from shunning the malicious agenda was willing to go an extra mile to give it space in his newspaper. The reason was more than business, as we found him wedded to the ideology of the RSS. After exchanging pleasantries, as Sharma settled down to discuss his agenda, we come to know that Martin has already briefed his boss in detail. Says Adimoolam: “I think Martin briefed me on your visit … You want to take some space and that’s not an issue. We have a lot of same wavelength with the BJP family is around … true Hindu family. We believe in Hindu spirituality.” In the same breath, he tells us that since his family wears their allegiance to RSS and BJP on their sleeves, it has hurt their business a lot. “We have been very strong RSS … but newspaper we are straightforward honest. We don’t… both the governments. In fact, last 35 years we haven’t got any government ads. We went to the court six month back and got it. So, 35 years no governments want to ad[vertise with us] and we whatever we feel we just write. We don’t bother about any government. That is why the central government is very close with our family,” says Adimoolam. He then goes on to tell about his father R. Lakshmipathy who was chairman of the Press Trust of India for many years and who headed the Indian Newspaper Society twice. They have now a favourable government at the centre. “So Central government we have been doing lot of things. You know after very, very long time, we have got honest straightforward government. A government who doesn’t want … who doesn’t run a government for elections,” says Adimoolam of the present government, as he launches into platitudes about how close to the Prime Minister his family, including his father, is and how the Prime Ministers makes a point to visit them personally whenever he is on a state visit. Union Minister Nitin Gadkari is also a friend. His father still visits Delhi once every month, we come to know. 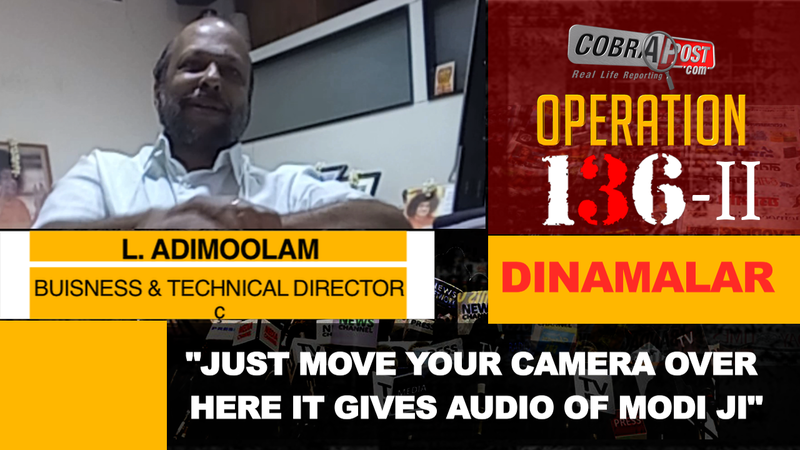 “Anything we are open for it and what best …,” says Adimoolam, to assure us now that he is completely on our side. He then tells us about some software that he has bought on license. This software can be applied to help in campaigns such as ours. “Sent to brochures, leaflet sent to party workers … say there is Modiji’s picture is there, just move your camera over here … it gives audio of Modi ji,” he informs us in not so elegant an English. The generational shift has ensured that no values of the profession remain sacrosanct particularly when you happen to be the votary of a particular ideology. We have received the response from Dinamalar Group to our detailed questionnaire. To read in full, please visit check here.